An eBook reader system. It is the most popular brand in Canada. 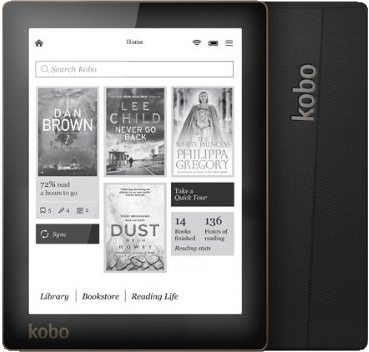 You can rent Kobo readers at libraries to read library eBooks or books you buy or download. They look like a Kindle touch. Kobo also sells software that also runs on Android, iPad, iPhone devices. It has software to share comments with other readers. Kobo keep coming out with new models with slightly different features, renaming them and discontinuing the old models. 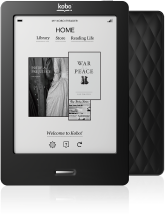 As of 2013-11-23, the models is ascending order of deluxeness are the Kobo Touch, the Kobo Glo, Kobo Aura and Kobo Aura HD, or Kobo ARC series. When you pay more money you get either a bigger screen or a backlit screen or colour. You can get them at Chapters-Indigo or at the link at the top. I would think most people would want the Aura and Aura HD. The Touch and Glo are a bit too small. Their reader has 2GB of storage, USB (Universal Serial Bus) and WiFi (Wireless Fidelity) connectivity. It comes in Lilac, Blue, Silver and Black. It supports ePub (Electronic Publishing), PDF (Portable Document Format), JPEG (Joint Photographic Experts Group) , GIF (Graphic Interchange Format), PNG (Portable Network Graphics) , BMP (Bitmap), TIFF (Tagged Image File Format) , TXT, HTML (Hypertext Markup Language) , RTF (Rich Text Format), MOBI (Mobile pocket eBook format) , CBZ, CBR. They have an online store selling eBooks for about $4 with over 1 million free eBooks. They have an affiliate program managed by Linkshare.com. 5” diagonal touch screen. Flipping a page takes about 2 seconds. The screen goes black during the flip, which is irritating. This is more of an issue than you might think. You can read very rapidly because the length of the line is intermediate between a newspaper column and a paperback book. Your eye naturally takes in an entire line at a pop without strain. The lines are well separated. So I would estimate you waste about 25% of your time waiting for the next page to show up because you have to flip pages far more often than you do a paper book. There is also about a 5 second delay when you first start reading a book as it is loaded from slow secondary memory to primary RAM (Random Access Memory). This is quite acceptable. 2 GB holds 1,000 eBooks. 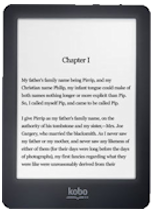 Holds up to 10,000 eBooks with a 32 GB SD Memory Card that plugs into slot on the top. Black and white e-ink that works in bright sunlight. Connects with WiFi or USB. The ad copy touts that the back is quilted. You might think this means it is soft and padded. This is not so. It just means there is a diamond pattern embossed into the plastic back. Maybe the higher end models are soft. The unit is remarkably thin and light. The power button is on the top right edge. I took me quite a while to find it. It is confusing since all buttons make the light flash even when the unit is off. The screen tells you to press it to turn the unit on, but don’t tell you where it is. It comes with an onboard manual. It is all pretty straight forward. I was surprised to discover you have to manually set up the date and time, like a microwave. I guess there was not enough room in such a tiny unit to build in time discovery. diagonal: 12.70 cm (5 in) 600 × 800 pixels, 7.60 × 10.20 cm (2.99 × 4.02 in) manual. 7” diagonal screen size. Colour screen. 64 GB. Runs Android apps. Full open access to Android 4.0 (Ice Cream Sandwich). Web browsing. Email. Has a built-in camera. Connects with WiFi 802.11 b/g/n and Micro USB. Choice of three fonts. Not a cellphone. No cellphone data connectivity. Though runs Skype via WiFi. Does not take voice commands. diagonal: 17.80 cm (7.01 in), 600 × 1024 pixels, 9 × 15.30 cm (3.54 × 6.02 in) manual. They also have an online bookstore called Kobobooks.com that sells eBooks. They have one affiliate program, run by Rakuten/Linkshare. The online bookstores gives you free previews. These are useless. They just let you look at the first 5 pages or so of a book that have no content, just copyright info, how to contact the publisher etc. Romance novels and books that could not otherwise get published predominate. The Vox has been replaced by the Arc. Light lets you read in the dark. manual. details. 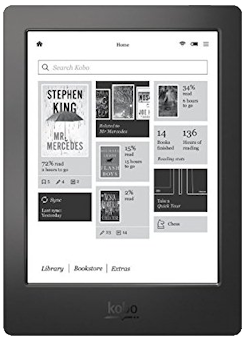 4 GB on-board memory, holds up to 3,000 eBooks. details. Very light weight. It is much easier to hold up than a paper back when lying on your back. Flipping a page is faster and easier than flipping a page on a paper book, but you do it more often. All your books in there. You take everything with you with no extra bulk. My apartment is crawling with books, some on shelves, cupboards, piles, boxes… It is quite a production to find a book. With the Kobo, it is all in your hand. Eventually all that book clutter could be eliminated. Illustrations and their captions are very hard to read. They don’t expand when you use larger type. It is very easy when using the D button to hit one of the four directions when you meant to hit the centre. You have to press your finger perpendicularly, not at a slant. Often it seems every time I hit the D it has a mind of its own and does something quite unexpected. You must be patient and not hit the D key twice. Since it takes so long to react, you don’t know if the problem is you failed to hit the key hard enough or it is just taking longer than usual. It needs some immediate feedback. The time it take to flip to the next page is excessive. The speed needs to be at least tripled. Perhaps if it rendered the next page in the background while you were reading the preceding page it could present it faster. Insanely complicated to borrow a book from the library. There is no way to highlight text, the equivalent to using coloured highlighters on paper books. It makes you wade through all the deadwood almost-blank pages at the beginning of a book. When I collect quotations, I have to retype them. When I read material on the net, I can collect them with my mouse. Footnotes don’t appear at the bottom of the page where they belong. They usually show up in the middle of the next page. This may be a limitation of the eBook format. It may not support footnotes properly. The index in a book does not let you jump directly to the page. In my used unit, borrowed from the library, it needed recharging after 1.5 books. This is quite a bit worse than advertised. It reloads a book even when it was the last book you were reading. This causes about 5 seconds of needless delay. The unit is quite delicate. If you are reading on a chesterfield and place it on the floor beside you, then step on it with a stocking foot when you get up, it is a gonner. I know this from personal experience. I presume dropping it would be similarly as catastrophic. If you borrowed the Kobo from a library they probably won’t just let you give them a new Kobo. They insist on buying it themselves, and they charge what they originally paid for the broken unit, not the replacement cost. This will set you back 2.5 times the going price. So if you plan to break your unit, it is much cheaper to buy it rather than borrow it. I tried connecting six different ports. None worked. Other devices work fine. I eventually got it to connect to a different computer. My unit seemed to have a defective touch screen. Most of the time it ignored me. Sometimes it would trigger the bar above or below the one I touched. It was almost impossible to type on the touch keyboard. It would trigger keys different from the ones I touched. I had to whack the screen hard and sharply to get touches to register. I felt I might damage the unit. When I took it back to the store, it miraculously started behaving properly. Maybe it needed a deep charge, a jostling on the bike ride, or being outside in the cold. It asks if you want to use Facebook to login, but provides no way to say no. There is no indication that you are online/offline. You can’t troubleshoot whether your USB connection is working. Sometimes it displays in words that is connected, but it is not. You cannot tell when it is charging or the current state of the charge. Though sometimes it will tell you. The automatic synchronise the time and date with the computer time and date does not work correctly. It gets the wrong time zone and the wrong time. It got the date correct however. I had to manually correct it. I could not get the correct time zone though. It insisted on showing PDT (Pacific Daylight Time) instead of PST. The sync takes about a minute even when everything is already synced. When I asked for English, it gave me French. It took me quite a while to find a way to change it back. Changing it on the Kobo utility does nothing. The manual that comes with it does not tell you what the two buttons or the flashing light is for. The left is the light. The right is power. The light sometimes blue and sometimes green. I have not yet figured out what this means. They gave me seven free books, one was creationist dog poo called Answering the New Atheism: Dismantling Dawkins’ Case Against God . Kobo has to be crazy to pick such as insulting piece of garbage as an intro. It makes me want to smash the Kobo on the ground, hardly the way to make a good first impression. It came with a $10 gift card with three unlabeled serial numbers on it plus one more on the receipt. The Kobo website rejected all four. This sort of incompetence makes me splutter with rage. You are supposed to go through an eject process before disconnecting the cord between your computer and the Kobo. You can’t do this from the Kobo touch screen. In Kobo Desktop, running on your PC (Personal Computer), click the Eject icon at the top right of the screen. Then you can unplug. However, often the icon is not there. I have not discovered how to coax it out of hiding. Alternatively, click start ⇒ Computer. Right click the Kobo reader device. Click Eject. The easy way to buy a book is to plug in your Kobo and start up the desktop Kobo app. It is pretty straightforward. The only catch, is you must use a credit card, not PayPal. The app remembers your account, password, address etc. The book appears in your library on local hard disk. From there it automatically gets synched into the Kobo. 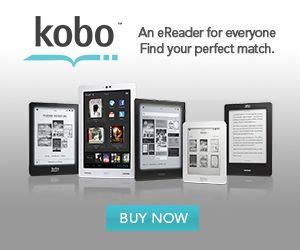 Login to Kobo and it will automatically download all your books into your Kobo including the freebies. next to your newly purchased book. It will have a ridiculous long gibberish name. It is probably best not to disturb it. If it is DRM (Digital Restrictions/Rights Management) free, you can read it with any sort of reader, including a software reader that runs on the desktop. Books at the Kobo bookstore are not copy protected. However, when you borrow eBooks from the library or you acquire eBooks from other sources they may be. For that, you need Adobe Digital Editions. For some reason, the standard Kobo software will not let you import unprotected PDF files. However, the Adobe software will do that. You must first authorise your computer by getting Adobe to assign your eReader a serial number. For that you need to first create an AdobeID account. The digital Editions app then can then optionally modify documents to run only on that particular Kobo. You drag your eBooks or PDF files onto the Adobe app (not copy/paste). It does not have an auto-sync. So you must then right click to copy them into your Kobo. This is so Mickey Mouse. The two programs should be merged into one seamless consistent whole. Arbitrary PDFs will not work as well as PDF eBooks. The type may be too small or the pages too wide to fit. You have a chicken and egg problem. You need to load the Kobo manual into the Kobo before you have much hope of learning how to load a document into the Kobo. These instructions will get you started. Find an interesting PDF document or ePub eBook on the Internet with your browser. Download it. You may have to view it first then right click save. Attach your Kobo to the USB port or to WiFi. Drag (not copy/paste) the downloaded book/document onto the Adobe Digital Editions app. Select the book then right click and select copy to device to copy it into your Kobo. You should just have to paste the name of the downloaded file or the URL of the document and have Digital Editions automatically download it if needed and copy it into the Kobo. The Kobo and Adobe software should be merged into one application. Login in to your library account. Navigate to the eBook section. Find an eBook you like and click borrow. Select the ePub or PDF version. They will ask you for your PIN. They mean your password. If your password does not work, give it your old password. The library eBook system has four passwords, two for the library, one for Kobo and one for Adobe. Keep in mind when you update your password, it will not update the others. Download the file to your hard disk. It will have a *.acsm name. Drag (not copy/paste) the downloaded book onto the Adobe Digital Editions app. You will see the book has a time limit. When that time limit is over, it will disappear like Cinderella’s coach without any action on your part. It is specially modified to run only on your Kobo. When you have finished reading the book, bring up Adobe Digital Editions and right click your book and click returned borrowed item. There should be no need for two library passwords. When you click borrow, the book should go directly into your Kobo. You should be able to return a borrowed book by tapping on the Kobo. It could then notify the library via WiFi or the next time there is a USB connection.